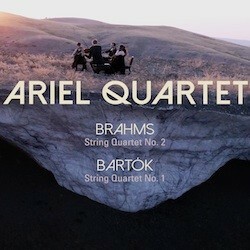 The Ariel Quartet, distinguished by its virtuosic playing and impassioned interpretations, makes its debut recording pairing two giants of the string-quartet world, Béla Bartók and Johannes Brahms. Both composers stand as significant pillars of the youthful Quartet’s two-decade-long journey. The Ariel Quartet earned its glowing international reputation early on, having formed in Israel when its members were students in middle school. The Ariel now serves as the Faculty Quartet-in-Residence at the University of Cincinnati’s College-Conservatory of Music Debut. This release is the first in a projected series pairing the quartets of Bartók and Brahms.